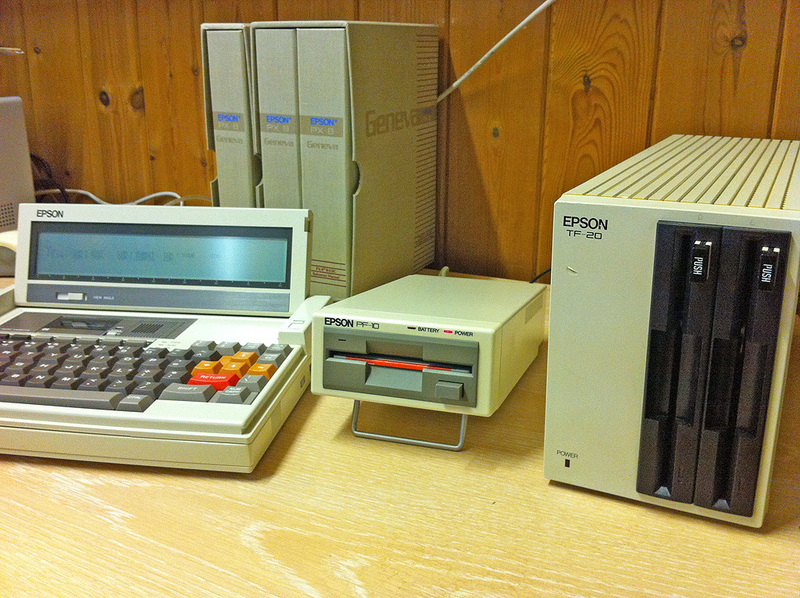 Well it seems Epson PF-10 floppy disk drives are somewhat like buses, you don’t see any for ages and then two come along at once. Much to my surprise given what I’d read and been told about the rarity of the PF-10, another one appeared on Ebay. This one was listed along with a PX-8 which I didn’t really need however I decided it was worth bidding just to acquire the drive. 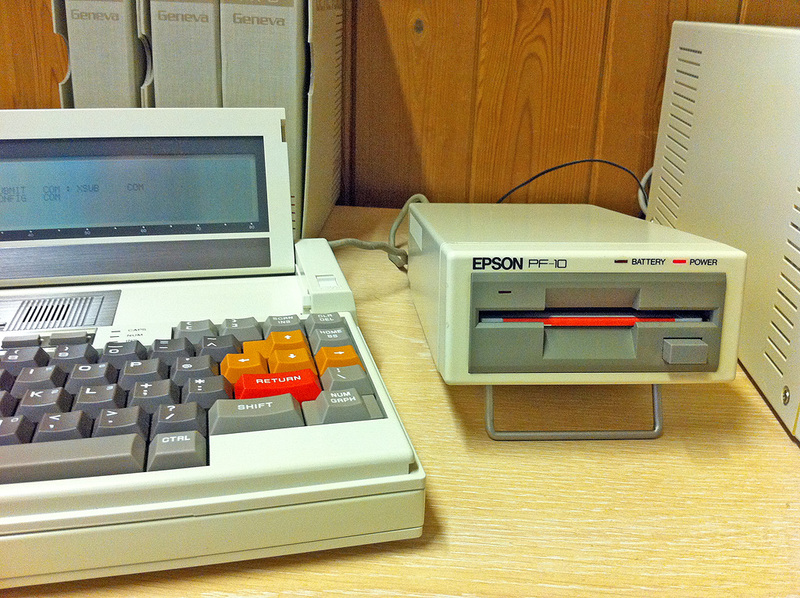 I duly won the auction, the PF-10 arrived and… it works! It’s a bit temperamental but I like a challenge. It’s in very good condition, especially compared to the rather beaten up drive I previously bought and it is sitting right next to me now, looking all Silent Running like, and somewhat dwarfed by the TF-20. Thus far I’ve managed to read, write and format some disks with it, the battery is a bit flaky and the drive unfortunately won’t run of off the power adapter, although it will take 4 C type standard batteries if required. I’m going to swap out the battery for the one in my other drive which seems more successful at holding a charge. I’m also going to set the required dip switch so I can daisy chain it with the TF-20. As a bonus (I hadn’t noticed it in the picture) the accompanying PX-8 was fitted with an external RAM disk which I had been on the look out for anyway. Unfortunately it’s currently giving me BDOS errors whenever I try to access it. I’m hopeful however that this is an issue with its batteries as opposed to any other damage. 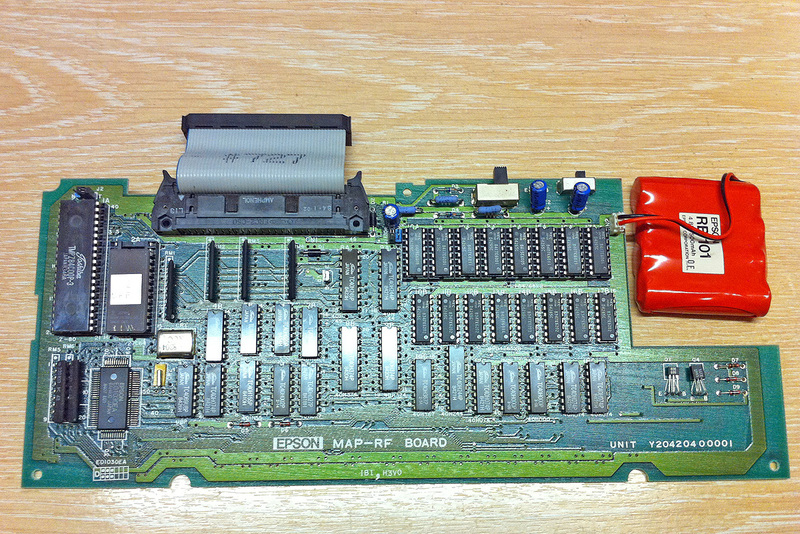 I took it apart to confirm that battery type which turned out to be an Epson RB 101, 4.8V 500 mAh. I’ve taken some pictures, unfortunately they are with my phone so I apologise for the quality, I’ll hopefully be able to take some proper photos soon, note the cheesy 70’s wood panelling, very apt.